Eatwith organise cooking classes and dinner experiences with local hosts all over the world. Our host for the evening was Ze, a local resident of Lisbon, and on our arrival we were treated to a welcome drink while we chatted about our jobs, our travels and everything in between. Ze explained that we would be preparing two starters and one main course and that there were some nibbles on the table for us already plus we would also be ending the night with a desert that had been prepared by him earlier. Before we tucked into the nibbles of cheeses, breads, hams, oil and rhubarb and chilli chutney (home-grown from his garden! ), Ze explained about the different regions of Portugal and where the foods were produced. We also learnt about the different wines that Portugal produced and were surprised to learn that there were so many different varieties and areas that the grapes were grown. After the nibbles had been eaten and with the wine flowing, Ze handed Cody and I an apron each and we headed to the kitchen to begin the cooking class. First up we were preparing a traditional Portuguese salad made with codfish roe. Cody crushed some garlic which was added to a pan of water with the roe to boil. We then chopped some onion and coriander and added smoked and unsmoked paprika, olive oil and white wine vinegar to make a salad. Once the roes were boiled, we broke them into smaller pieces and mixed them in with the salad. The second starter we prepared was fresh clams. We added olive oil, a bay leaf and generous amounts of crushed garlic to a pan and let it simmer for a while. Ze taught us that we should leave the skin on the garlic to enhance the flavour too! When the pan was ready, we added the clams and let them steam until they opened and we added some more coriander. We then served the clams and sat down to eat our two starters. After more chatting and eating, it was time to head back to the kitchen to prepare the main course of codfish. We added olive oil, garlic, bay leaves and onions to a pan and left it to simmer. Once ready, we added the cod, potato shavings and four eggs then stirred the pan so as not to allow the eggs to cook, but to become creamy like a carbonara sauce. We served the cod along with a side of salad and a home-made dressing. The whole course only took us around 10 minutes to prepare and it was delicious. Ze was an incredible host and taught us how simple it is to cook delicious food with just a few ingredients. Dessert was creme brûlée – Cody’s favourite dessert so he was happy! – which Ze had made with lemon zest and it was soooo good! We enjoyed this with some port and chilli chocolate to end a wonderful evening. We had so much fun with Ze and learning to cook the Portuguese food, that we didn’t leave until after 1am! Taking a cooking class like this with Eatwith is such a great experience which feels much more personal than a regular cooking class as you’re welcomed into someone else’s home and taught the authentic methods that they have learnt over the years. 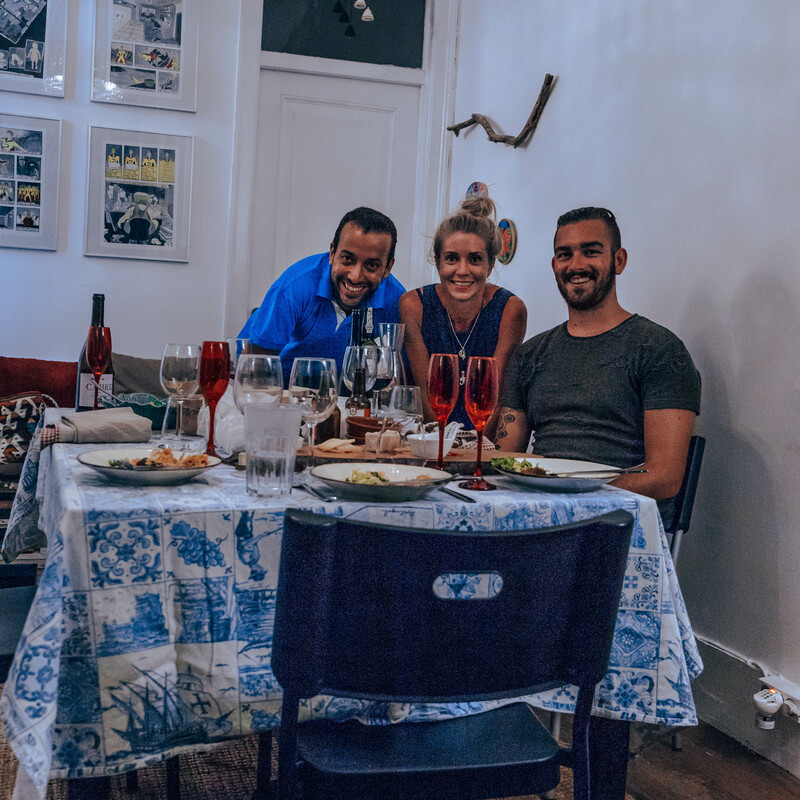 Eatwith offer many different dinner and cooking experiences throughout the world and I would recommend anyone, any age, in any country to try one. You’ll create beautiful memories and even pick up some tips to take back to your kitchen at home. It’s cheaper than a meal out in a restaurant and you’ll leave feeling not only full from the delicious food but also full of joy from such a wonderful evening which is a memory that you’ll never forget. If you want to book an evening with Eatwith, please CLICK HERE to visit the website. You can find Ze by searching his experience name “Learn The Essentials Of Portuguese Cuisine” within the website.